So 240 more howling wolves to go, at about 15 a day that should 16 days so with weekends about 3 weeks! 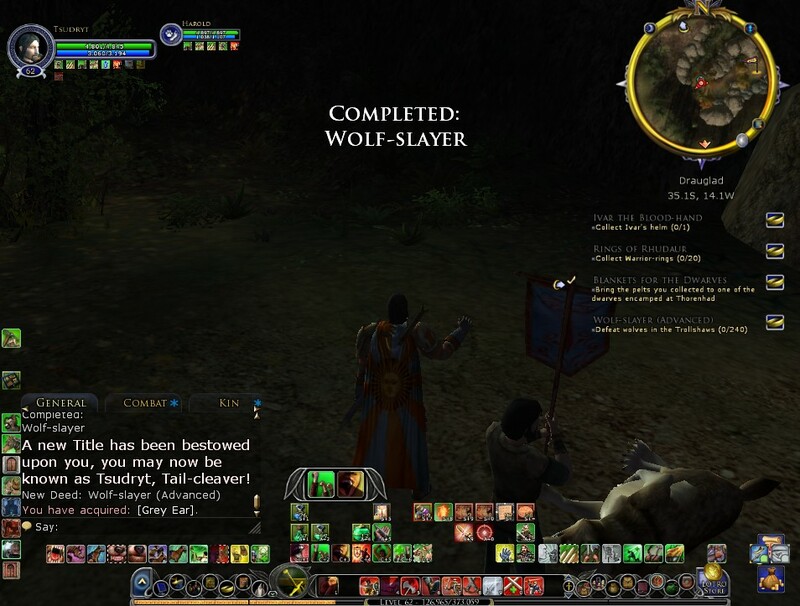 LOTRO: I finished with the BOG! ‘But now it’s too late there’s no escape, from what they have done. I’m goin’ deeper underground, there’s too much panic in this town. The Great Delving – DONE but spending a lot of time here…there…in fact here and there! 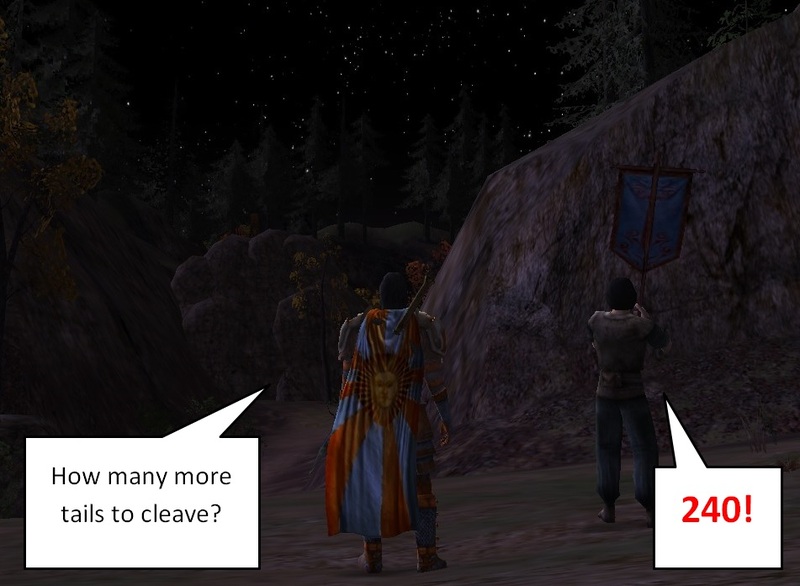 I blame my Nr.2 son who got up very early (cutting short my LOTRO Sunday by 2 hours!) and insisted that he be able to watch ‘Manny Manitas’ his favorite kids cartoon at the moment (Handy Manny)! 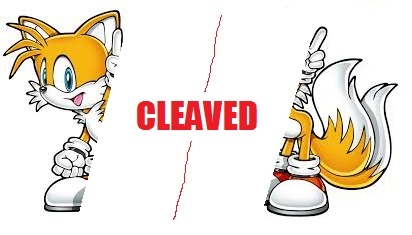 Bought crafted relics of agility for halberd and belt…looking for some might…but all that was for sale in AH. The other night managed to get to 58 …after dying twice doing a Tucky run, due to falling asleep at the keyboard…I called it a night thereafter. The last 2 mornings Tsudryt has been running around Dolvens View: he wrapped up Advanced Horny Deed in the Library, with the help of a lv85 harvesting like mad, he must have been irritated at my slow efforts, as he just invited without any chat…normally a turn off for me but I could see the speed he was going so I just joined in and COR did it fly by…was hard to drag myself away as I could see Bounders bags and rep items piling up…but I was here to do deed and deed was done. The 100 bounders tokens collected here have almost wrapped up deed3! On the walk back I killed an Orc that stupidly tried to stop me…and that completed the Orc advanced killing deed…a nice surprise I didn’t think I was anywhere near! To help with levelling I have been running the following skirmishes: ‘Attack at Dawn’ which is getting tricky as some of the big mobs are requiring new strategies to defeat and ‘Tuckburough’ still nice and relaxing …when awake! Training hall: 12 Orkish Recruits, 8 Orkish Veterans and 3 Vigilant Taskmasters and 1 Uruk Battle-master…when orange was very challenging like running into a tornado; now it’s a bit of a breeze, it is still a breath of fresh air that lows relics and xp Tsudryt‘s way! The Spider-nest …imbued sapphires and adamants for the others…I bought 1 imby adam on AH before but failed completely to save dwarves from being eaten by spiders…a shocking experience which drives me to do it again…just need those adamants. 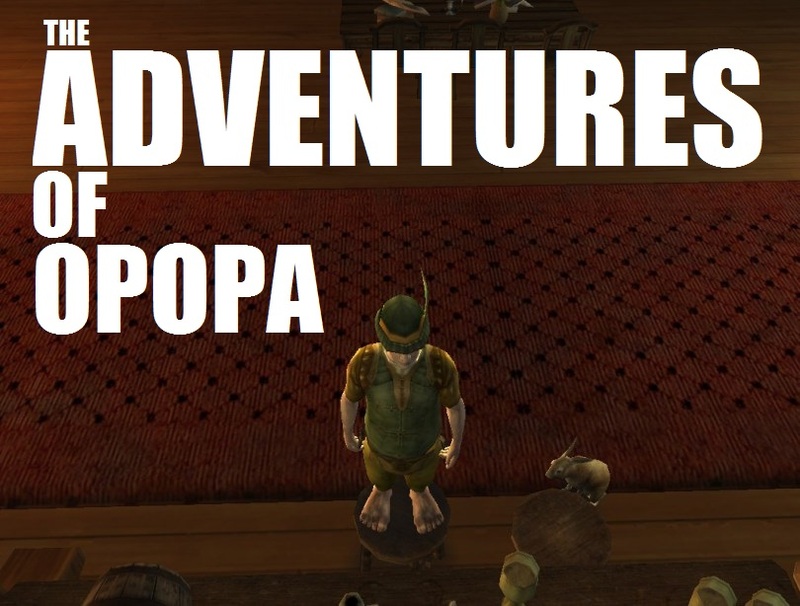 Seen some amazing mass slaughter Youtube vids: search The Spiders Nest LOTRO. Hadudbâb …er half way along the wavy lined path with no mobs…2 dwarves and an elf stand around…there are 2 doors to 2 different libraries…basically once a day accept all the quests and run in and upwards killing almost everything and picking up books as you go along…kill final boss and return for Iron Garrison Token…exchange them for XP items for LI of barter for ‘Golden Flowers’ from the elf…useful later I have heard. Find the bottoms of the Pits of Moria. I think this is my outstanding Boar..oh dear I sense a boar hunt! Bounders bags coming to an end…HD arriving so soon! Heh they’re gonna wreck it down yeah..
Not giving up his new Legendary Halberd! Tsudryt explores The Great Delving, looking for Durin’s Threshold and Shemeldurj, not to be confused with ‘she that has melding urges’. 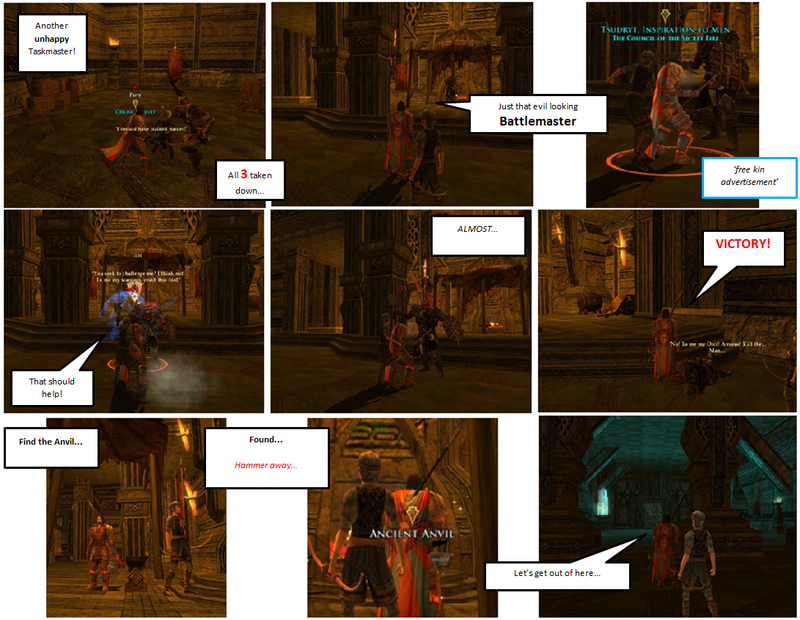 Tsudryt had a Welcome to Moria from Bedbugs, which he promptly killed. Then after Honouring the Fallen and Setting Up Shop in An Ominous Tunnel in A Deep Place he had A Deep Thought, recovering from the aftereffects of thinking too much he decided to set off In Pursuit of others to Examine a Dwarf-axe found laying on the ground east of Túbi Thickfist. A Watchful Glance of which directed him to progress to the Goblin camp at Snaga-maudhûl where Sealing the Gate against Rumours in the Tunnels was the first priority. Stealing Back to go Ever Forward, Tsudryt progressed to Lamâb-dûm where An Ancient Hope that the Scent of the Hive or The Noise of the Gredbyg would draw out The Hive-Queen. The Queen was destroyed easily so Tsudryt headed To the Dolven-view and then went to explore the wonders to be found at The Palace of Náin. In deed he got some New Growth after he had to Examine an Unusual Fungus found on same level of palace as Lamâb-dûm, his vision went all funky! He still managed to succeed in Lighting the Way again he had to Examine something, this time a Moria-mirror found on upper level of the palace. 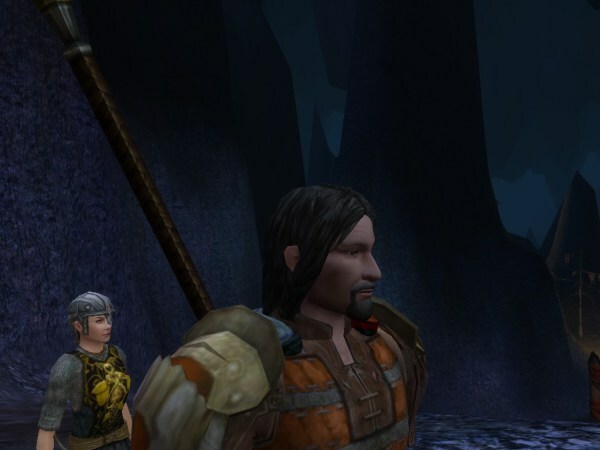 Tsudryt’s vision returned after he returned to The Dolven-view where after restocking and reforging his legendary weapon he headed out to find some Claws of the Deep. He had to Clear Tunnels so that The Road is Ours before Scouting Ahead. Back at Dolven-view he found some Dwarves offering to upgrade his legendary weapon all he had to do was some Legendary Item Title Quests: he chose to do the The Training Hall, but the others didn’t interest him:The Mithril Slaves, The Ghost-forge, The Morroval-outcasts, The Spider-nest and, The Library of Steel. The destruction of trainee Orcs was simple enough but their taskmasters all 3 of em proved too tricky, the battle hardened leader kicked Tsudryt hard out of the area. 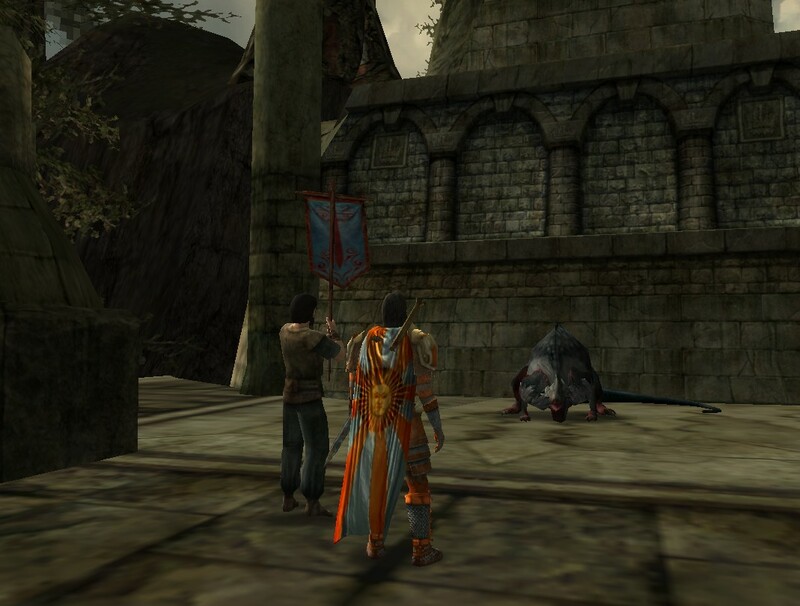 Tsudryt retreated to Gazatmur and discoved that the Servant of the White Hand, after having to Examine the Mark of the White Hand dropped by goblins at Gazatmur. Were Enemies Forever and that they needed to be told, “Go And Stay Out!”. The Goblin Overseers stood on Shaky Foundations and were unable to stand their ground! A Long Echo was heard which led to Tsudryt Opening the Waterways and Securing the Library, before heading off to The Cooling Chamber to cool down. In a Instance: The Cooling Chamber transported Tsudryt To the Deep Descent this Vector to the Silvertine Lodes was quite unexpected. Before heading off to the ‘lodes’ he explored Katûb-zahar and solved Riddles in the Library. He had to Examine Falgeirr’s Papers found on ground at the entrance before passing them on back at the Dolven-view. Finally heading off to The Silvertine Lodes, the The Deep Descent where Tsudryt hopes to be Banding Together with others to continue his exploration of the Mines of Moria! Mine all Mines of Moria! 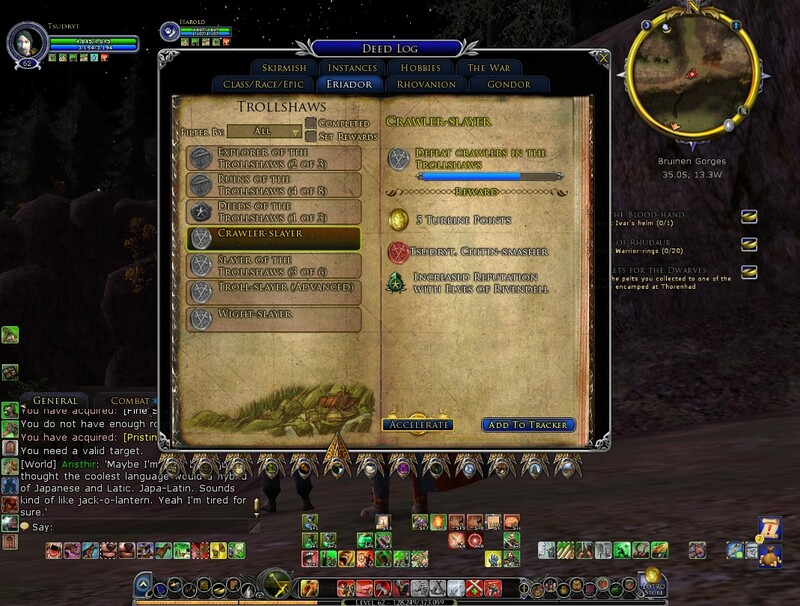 LOTRO: Legendary at last, Cephalopod watches no more! 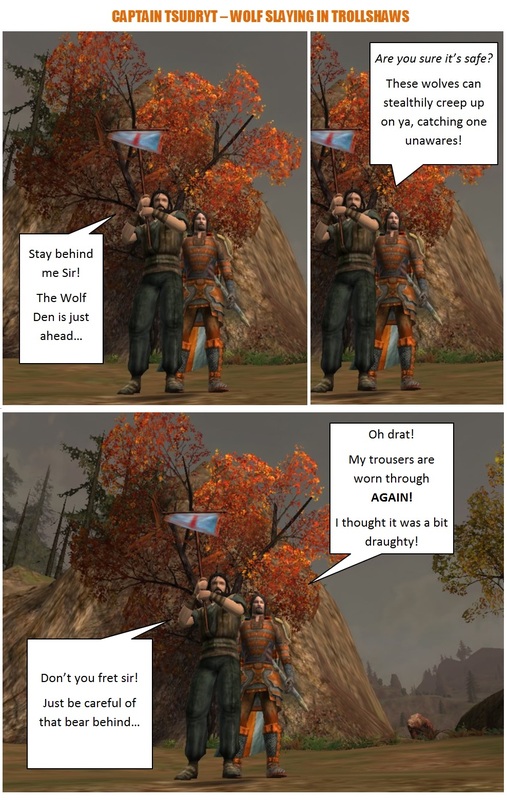 Tsudryt GOT his hands on his legendary weapon…so continues to wrap up Volume II, book 1 of the Epic quests. I ran a Tucky skirmish to finally get to my new growing halberd to lv10, I died twice which was strange…I think I was just out of practice. 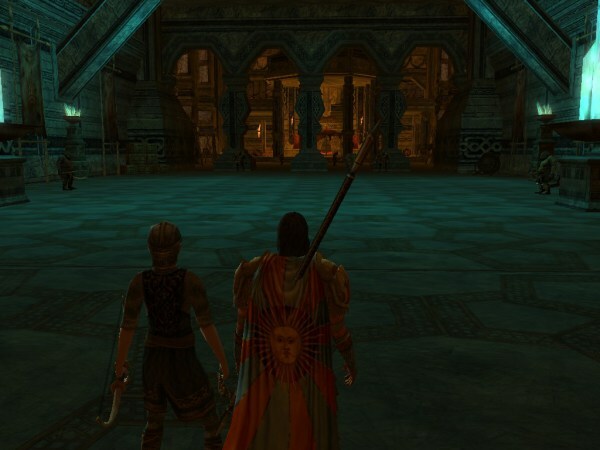 So off to find a Forgemaster…in Thorins Hall. 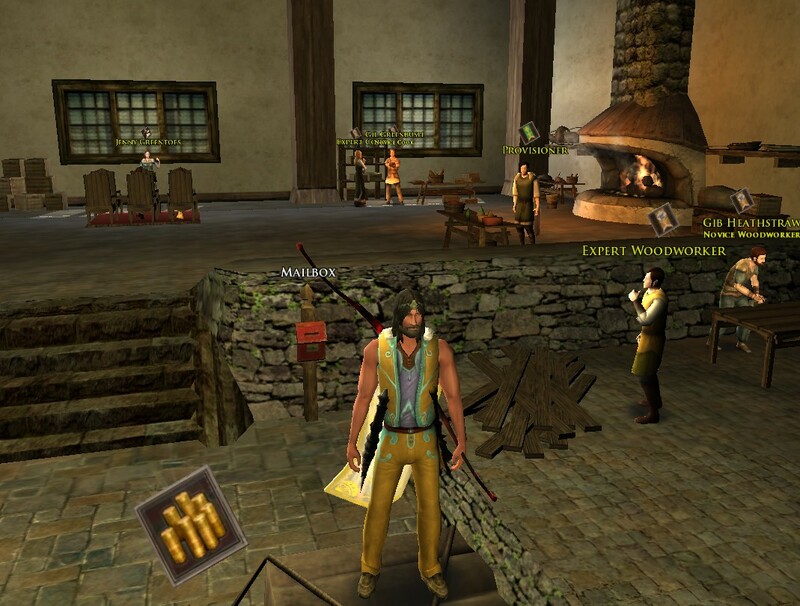 Aside: Tsudryt has been homeless for quite sometime, today he became proud new owner of 1 Roaring Road (basically close to the door as possible), deluxe house with 2 storage chests, now I wish I had a wardrobe for all the various pieces of bound equipment he has but cannot place in his housing chest! So after today getting back to Thorin’s Hall will always be a easy, good as he needs to visit the Weaponsmith guild quite a bit. Reforged Halberd and then have to head back to entrance to the Walls of Moria to speak to Ráthwald. No knock backs, no being picked up by tentacles, no having to hack a tentacle to save a dwarf, no point! No cephalapod nightmares induced! Chapter 14: Khazad-dûm at Last! Durin’s Bane, the Balrog of Moria. So Tsudryt needs to get his Emblem fitted and now he needs to get a sturdy Goat for Moria adventures…so to Thorins Hall and then Sarnúr. ‘All in all it was just a brick in the wall. 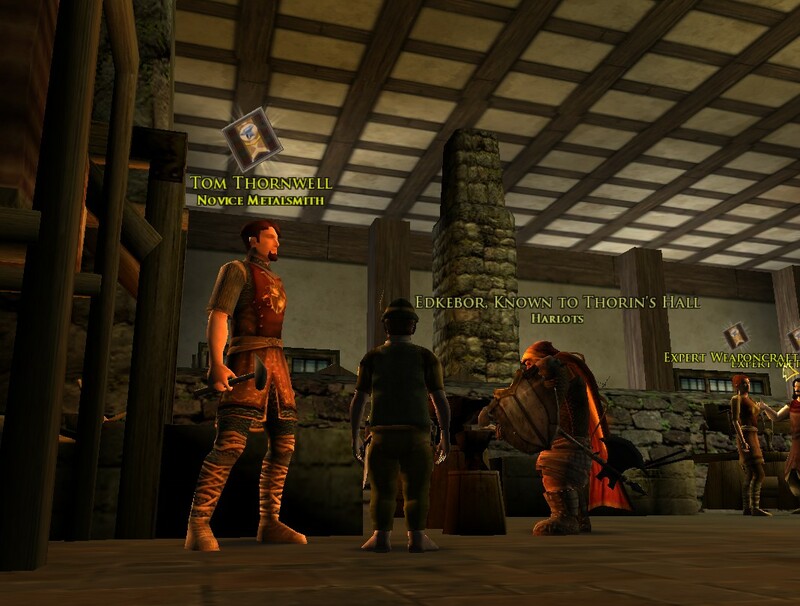 Tsudryt, really wants to get his hands on a legendary weapon…so continues to try and wrap up valume II, book 1 of the Epic quests…I forgot to mention that I was shocked at the poor voice acting in this the introduction to Moria, simply dwarves with North American Accents a bit too far out! Well ….easy to get lost and I hadn’t even realized I had picked up all the quests I needed when I completed all the quests I needed. Lots of orange orcs to squeeze! 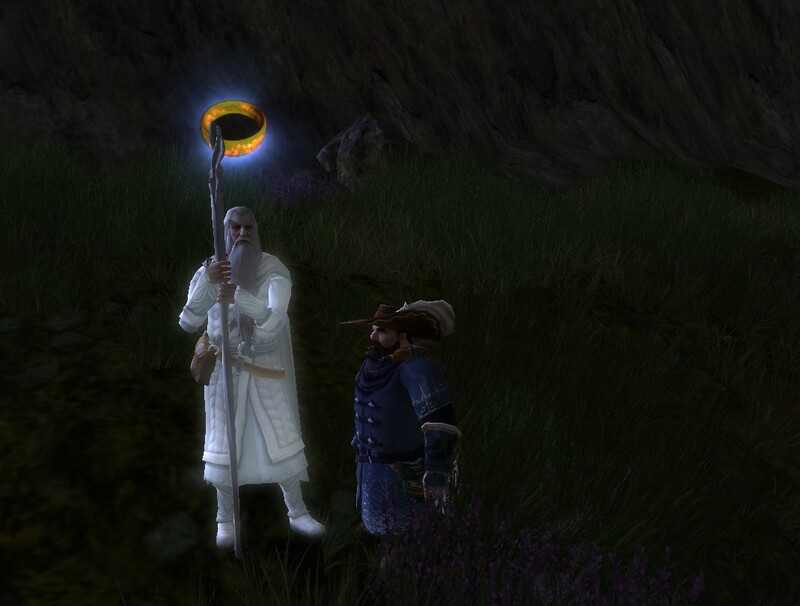 Get to be a lv60 dwarf in olden LOTRO times…and we get to run around doing silly quests just like modern times in LOTRO! I think a cinematic with Mr. Balrog running loose in the city causing mass destruction and Mr. King Duran Duran could then have some kind of epic confrontation! In the end I am told to escape from the Balrog and the passage is blocked so I went running around (took some screenies) and uh-oh died! This is not good as now I have to re-do the whole bloody thing! And it is not exciting…although the Balrog was OK! ‘I have seen the writing on the wall. Instead of repeating Tsudryt continued the legendary journey! Have a chat with Warr (running out of ideas for names…) Uh ah Uh ah! Sent to find some pickaxe handles..
Bosi arrives, you get to remove the last 2 pieces of rubble…oh thx guys! Tsudryt as feared was not offered a doubled handed sword so he chose the Halberd, took it to elves in Rivendell…then forgemaster…equiped…slotted a relic…. 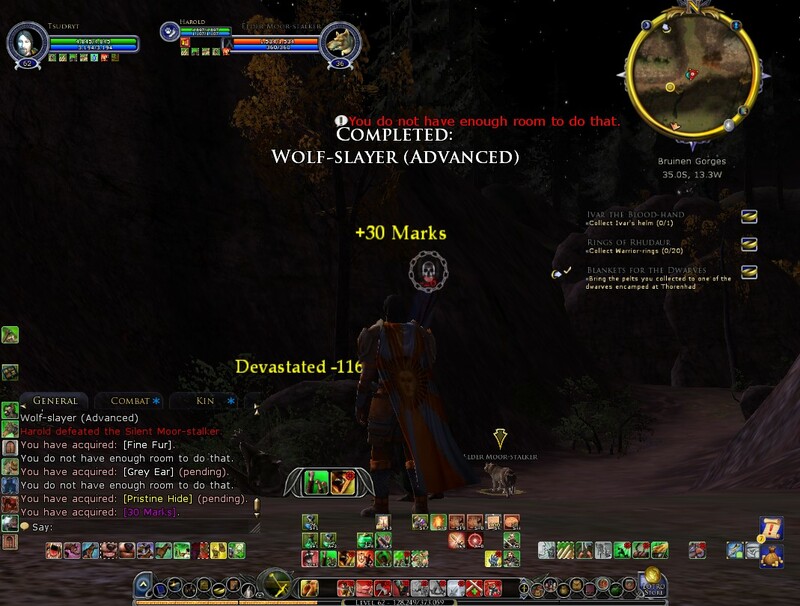 ONGOING…lv 8 from warg and wolf hunting in Eregion…maybe Skirmish would be a good idea? ‘All in all it’s just another brick in the wall.